Want to see what's new? We've got fabric, books, patterns, tools and more! Great gift ideas to make or give! 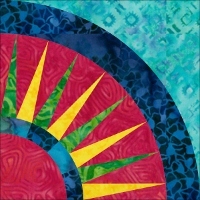 We sell only quilt-shop quality fabrics -- nothing you will find in a chain or "big-box" store. We also scan every piece of fabric we carry. All scans are 8.5" x 11", and are scanned parallel to the selvedge. Patterns chosen to highlight the beauty of our batik fabrics. Our Block of the Month programs offer you an affordable way to create beautiful quilts, one step at a time. We create kits to make it easy for you - the quilt-shop-only fabrics you need assembled already. Think of it as a "quilt-in-a-bag" ready to go when you are. We've got some fun stuff here that may or may not be quilt-related, or even sewing-related, but we hope you like it as much as we do! Here you'll find the notions and tools you need -- needles, scissors, cutters, mats, rulers, buttons, thread, etc. We've marked down these items to make room for new stuff!